To island hop the Caribbean is to sail in the wake of Columbus, Cousteau – and a throng of sun- seeking mariners. If nodding palms and fragrant rum are your idea of treasure, these 7,000 islands scattered like emeralds over a topaz seascape are full of riches. Nowhere else on the planet combines history, pleasure and white-knuckle adventure in such a pretty package. And despite the damage wreaked by hurricanes Irma, Jose and Maria, recovery efforts have been admirable and the islands are welcoming boats back. While the big hitters are familiar to us all, splashed across advertising boards to lure masses towards the winter sun, there are still plenty of islands that have escaped the curse of the cruise ship. 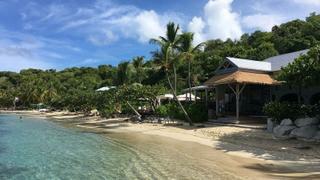 So, set your compass, escape the crowds, and head for this alternative sun-kissed shortlist... Cooper Island, BVI Location: A rum and sun-soaked hideaway south of Virgin Gorda The British Virgin Islands clearly understand the value of maintaining a luxury yacht paradise in this watery Eden. To this end, authorities sank a dozen holed hulls to form Wreck Alley in the 1990s. Grouper, bar jacks and angel fish now patrol this scuba site par excellence. The ocean bed graveyard includes the freedive-friendly Inganess Bay, a 41 metre Dutch freighter with the masts poking up in 14 metres of Caribbean Sea. On dry land the eco-friendly Cooper Island Beach Club is home to the BVIs’ nest rum bar (serving Appleton, Myers’s and Mount Gay) plus a microbrewery that produces Cooper Island’s own Turtle IPA. “For every beer sold, $1 goes to the BVI Sea Turtle Programme,” explains resort manager Samantha Baker. This helps safeguard the 20 resident turtles that live beyond the mooring buoys in the bay. Copper Island was damaged last hurricane season but has recently (April 1) successfully reopened. To island hop the Caribbean is to sail in the wake of Columbus, Cousteau – and a throng of sun- seeking mariners. If nodding palms and fragrant rum are your idea of treasure, these 7,000 islands scattered like emeralds over a topaz seascape are full of riches. Nowhere else on the planet combines history, pleasure and white-knuckle adventure in such a pretty package. And despite the damage wreaked by hurricanes Irma, Jose and Maria, recovery efforts have been admirable and the islands are welcoming boats back. The British Virgin Islands clearly understand the value of maintaining a luxury yacht paradise in this watery Eden. To this end, authorities sank a dozen holed hulls to form Wreck Alley in the 1990s. Grouper, bar jacks and angel fish now patrol this scuba site par excellence. The ocean bed graveyard includes the freedive-friendly Inganess Bay, a 41 metre Dutch freighter with the masts poking up in 14 metres of Caribbean Sea. On dry land the eco-friendly Cooper Island Beach Club is home to the BVIs’ nest rum bar (serving Appleton, Myers’s and Mount Gay) plus a microbrewery that produces Cooper Island’s own Turtle IPA. “For every beer sold, $1 goes to the BVI Sea Turtle Programme,” explains resort manager Samantha Baker. This helps safeguard the 20 resident turtles that live beyond the mooring buoys in the bay. 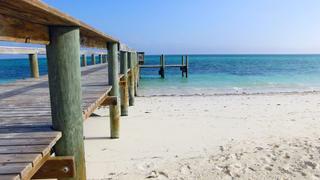 Copper Island was damaged last hurricane season but has recently (April 1) successfully reopened. Water Island – renowned for its sweet queen conch and spiny lobster – was once a Danish possession. That is, until the US purchased this slice of paradise from Denmark for a laughable $10,000 in 1917. During the Second World War, the US Department of Defence built Fort Segarra to protect St Thomas’s submarine base, which is within swimming distance. The square mile of sand-fringed island, shared by just 182 lucky locals, only became part of United States territory in 1996. “Water Island’s low population makes for unspoilt beauty,” says Tom Barnes, a sales and charter broker at Bluewater. “It’s on most of our USVI itineraries.” Today guests can tour Fort Segarra’s vine-choked gun emplacements, which boast a fabulous view across the other US Virgin Island shores. If you want to sojourn on Water Island then you need a yacht. This turquoise-framed squiggle doesn’t have a single hotel to its name, which renders those icing sugar beaches emptier than a champagne bottle at Le Club 55. All US VI shorelines, even Sprat Point, where nodding palms are serenaded by green-throated carib birds, are publicly accessible by boat. Water Island – renowned for its sweet queen conch and spiny lobster – was once a Danish possession. That is, until the US purchased this slice of paradise from Denmark for a laughable $10,000 in 1917. During the Second World War, the US Department of Defence built Fort Segarra to protect St Thomas’s submarine base, which is within swimming distance. The square mile of sand-fringed island, shared by just 182 lucky locals, only became part of United States territory in 1996. “Water Island’s low population makes for unspoilt beauty,” says Tom Barnes, a sales and charter broker at Bluewater. “It’s on most of our USVI itineraries.” Today guests can tour Fort Segarra’s vine-choked gun emplacements, which boast a fabulous view across the other US Virgin Island shores. If you want to sojourn on Water Island then you need a yacht. This turquoise-framed squiggle doesn’t have a single hotel to its name, which renders those icing sugar beaches emptier than a champagne bottle at Le Club 55. All US VI shorelines, even Sprat Point, where nodding palms are serenaded by green-throated carib birds, are publicly accessible by boat. Providencia is a geopolitical anomaly. Stranded midway between Jamaica and Costa Rica, it sits 450 miles from the Colombian mainland. A former stronghold of the canny pirate Captain Morgan, its 5,000 inhabitants speak English, look Spanish and party with chilled Caribbean élan. Most profess the Rastafari faith, and many frequent the shorefront reggae bars that thump beats across the open ocean. The Spanish called Providencia’s waters el Mar de los Siete Colores – the sea of seven colours. The seabed in McBean Lagoon by Providencia’s tiny airstrip (which welcomes just three turboprops per week) shelves from sandy topaz to navy blue depths. Little wonder it forms Colombia’s smallest national park. Red snapper and trigger fish may hide in the coral, but Providencia is a volcanic island. It rises more than 300 metres to an ironwood forest; footpaths lead to Providencia’s laid-back little sister, the island of Santa Catalina, reached by a rope bridge. It’s here that treasure seekers search for Captain Morgan’s buried loot. Yacht guests can content themselves with a dive near the rock formation of Morgan’s Buttocks, where the El Espiral scuba site contains a spiralling 30 metre tunnel garlanded with gorgonian fans. Providencia is a geopolitical anomaly. Stranded midway between Jamaica and Costa Rica, it sits 450 miles from the Colombian mainland. A former stronghold of the canny pirate Captain Morgan, its 5,000 inhabitants speak English, look Spanish and party with chilled Caribbean élan. Most profess the Rastafari faith, and many frequent the shorefront reggae bars that thump beats across the open ocean. 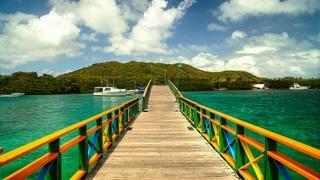 The Spanish called Providencia’s waters el Mar de los Siete Colores – the sea of seven colours. The seabed in McBean Lagoon by Providencia’s tiny airstrip (which welcomes just three turboprops per week) shelves from sandy topaz to navy blue depths. Little wonder it forms Colombia’s smallest national park. Red snapper and trigger fish may hide in the coral, but Providencia is a volcanic island. It rises more than 300 metres to an ironwood forest; footpaths lead to Providencia’s laid-back little sister, the island of Santa Catalina, reached by a rope bridge. It’s here that treasure seekers search for Captain Morgan’s buried loot. Yacht guests can content themselves with a dive near the rock formation of Morgan’s Buttocks, where the El Espiral scuba site contains a spiralling 30 metre tunnel garlanded with gorgonian fans. “The Dog Islands, between Scrub Island and Virgin Gorda, are one of our best kept secrets,” says Ginny Hawksley, of the British Virgin Islands Tourist Board. “There’s an abundance of fish and very beautiful coral, perfect for snorkelling and diving.” Mooring at the 12 official buoy clusters around the chain of five uninhabited islands is limited, where the only viable anchorages are Great Dog and George Dog. This makes a shore assault by paddleboard, kayak or RIB an adventurous must. The Dogs take their name from a colony of barking seals that basked there in the past. Now the National Parks Trust (which maintains the most alluring BVI sights from Gorda’s cavernous Baths to Tortola’s Sage Mountain rainforest) governs an endless parade of reef fish and coral. 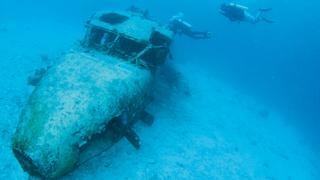 The best dive-over-the-side moment comes at the aeroplane wreck in 12 metres of clear water near Great Dog. It’s the remains of an Atlantic Air turboprop that overshot the runway at Tortola in 1993, then was sunk here with oxygen masks still dangling from the ceiling. “The Dog Islands, between Scrub Island and Virgin Gorda, are one of our best kept secrets,” says Ginny Hawksley, of the British Virgin Islands Tourist Board. “There’s an abundance of fish and very beautiful coral, perfect for snorkelling and diving.” Mooring at the 12 official buoy clusters around the chain of five uninhabited islands is limited, where the only viable anchorages are Great Dog and George Dog. This makes a shore assault by paddleboard, kayak or RIB an adventurous must. The Dogs take their name from a colony of barking seals that basked there in the past. Now the National Parks Trust (which maintains the most alluring BVI sights from Gorda’s cavernous Baths to Tortola’s Sage Mountain rainforest) governs an endless parade of reef fish and coral. The best dive-over-the-side moment comes at the aeroplane wreck in 12 metres of clear water near Great Dog. It’s the remains of an Atlantic Air turboprop that overshot the runway at Tortola in 1993, then was sunk here with oxygen masks still dangling from the ceiling. At the extreme south-eastern end of the Bahamas, Crooked Island is a haven that time forgot. It envelops the 500 square mile lagoon of Bight of Acklins, which remains as pristine as when Columbus first sailed in. Leatherbacks are regulars at Turtle Sound and schools of wary bone fish frequent the gin clear waters. To try your hand at luring these lightning fast fish with a fly, call Arnette Chisholm at Chester’s Highway Inn Bone fish Lodge, located on the north of the island. Sea kayakers can cruise the sandy-bottomed sapphire shallows, while sailors might set up a game of beach cricket and never see another soul all day. Mayreau is the smallest inhabited island in the Grenadines. And that’s what makes it such a perfect superyacht destination, says Summer Osterman of Burgess. “It represents the quintessential ‘untouched’ Caribbean – an island where you truly feel like you have left all your worries behind and are lost in time.” Its proximity to the Tobago Cays – a vast lagoon marine park untouched by human habitation – renders Mayreau a key stop on week-long charters. A private boat is an absolute necessity. Mayreau is inaccessible by chopper, plane or – heaven forbid – cruise ship. 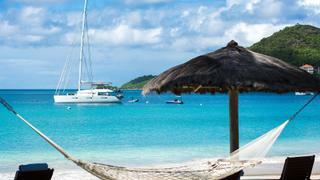 “The protected Salt Whistle Bay provides a picture-perfect Caribbean anchorage,” adds Osterman. “It’s a crescent shaped sanctuary with super-fine, sparkling white powder sand and gin-clear water. Charter guests are mesmerised by the natural beauty.” Google it and you will be too. Its proximity to the Tobago Cays – a vast lagoon marine park untouched by human habitation – renders Mayreau a key stop on week-long charters. A private boat is an absolute necessity. Mayreau is inaccessible by chopper, plane or – heaven forbid – cruise ship. 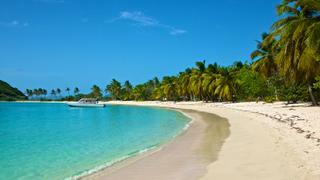 “The protected Salt Whistle Bay provides a picture-perfect Caribbean anchorage,” adds Osterman. “It’s a crescent shaped sanctuary with super-fine, sparkling white powder sand and gin-clear water. Charter guests are mesmerised by the natural beauty.” Google it and you will be too. Known as the island where billionaires go to escape from millionaires, Canouan gives its glitzy neighbour Mustique a run for its money on the luxury stakes. Even more so since a vast new superyacht marina opened at Glossy Bay in 2017 and Mandarin Oriental took charge of the Pink Sands Club. Imagine a retreat where private chefs serve Grenadine crab sushi spritzed with yuzu citrus; plus, a fabulous golf course is positioned so that guests can ping a ball 200 yards over the top of their anchored yacht. However, it’s the island’s natural credentials that make it a utopia on sea. Yachts enter through a barrier reef that endows the island with eggshell blue shallows and tiny islets that shout “shipwreck me now”. 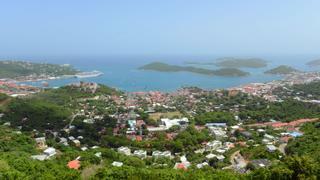 To see why Canouan translates as Island of Tortoises, take a hike up Mount Royal. The summit’s Instagram moment is the snaking island view across to Carriacou and Petit St Vincent, as hummingbirds utter above the aloe. Known as the island where billionaires go to escape from millionaires, Canouan gives its glitzy neighbour Mustique a run for its money on the luxury stakes. Even more so since a vast new superyacht marina opened at Glossy Bay in 2017 and Mandarin Oriental took charge of the Pink Sands Club. Imagine a retreat where private chefs serve Grenadine crab sushi spritzed with yuzu citrus; plus, a fabulous golf course is positioned so that guests can ping a ball 200 yards over the top of their anchored yacht. However, it’s the island’s natural credentials that make it a utopia on sea. Yachts enter through a barrier reef that endows the island with eggshell blue shallows and tiny islets that shout “shipwreck me now”. 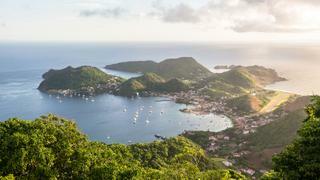 To see why Canouan translates as Island of Tortoises, take a hike up Mount Royal. The summit’s Instagram moment is the snaking island view across to Carriacou and Petit St Vincent, as hummingbirds utter above the aloe. Home to 3,000 blue-eyed locals, who claim descent from a clan of Breton sailors, the French call these islands un petit paradis. You can buy a baguette on two islands – Grand-Terre and Basse-Terre – but the other seven remain entirely uninhabited but for green iguanas, blue-headed hummingbirds and red land crabs. If Robinson Crusoe owned a RIB and a cool box of Carib, this is where he’d have come. As the nine Saintes islands are volcanic, they rise high and shelve deep. Apart from the coral dwellers at teeny-tiny Îlet à Cabrit – think seahorses, damsel fish and spider crabs – seven species of turtle cavort in translucent seas. The Dominica Passage plunges through Le Coche and Grand-Îlet, bringing humpbacks, dolphins and sperm whales to breed in the warm seas of the Antilles. They are a mere handful of the 15 cetacean species that can be seen from a yacht’s deck year-round. Home to 3,000 blue-eyed locals, who claim descent from a clan of Breton sailors, the French call these islands un petit paradis. You can buy a baguette on two islands – Grand-Terre and Basse-Terre – but the other seven remain entirely uninhabited but for green iguanas, blue-headed hummingbirds and red land crabs. If Robinson Crusoe owned a RIB and a cool box of Carib, this is where he’d have come. As the nine Saintes islands are volcanic, they rise high and shelve deep. Apart from the coral dwellers at teeny-tiny Îlet à Cabrit – think seahorses, damsel fish and spider crabs – seven species of turtle cavort in translucent seas. The Dominica Passage plunges through Le Coche and Grand-Îlet, bringing humpbacks, dolphins and sperm whales to breed in the warm seas of the Antilles. They are a mere handful of the 15 cetacean species that can be seen from a yacht’s deck year-round.